In previous posts I have addressed how to write rhetorical precis (very brief, four sentence summaries of the reading you are doing), synthetic notes (brief summaries of articles, focusing on the Abstract, Introduction and Conclusion as per the AIC method), and memorandums (longer, 1000-2000 word briefings that synthesize the content of an article, but also engage with the broader literature). Recently, a number of people have asked me how they can extend a synthetic note and write a full-fledged memorandum based on it. This post is intended to explain my process. I used an example of an article I was reading recently (Alida Cantor’s discussion of the material, political and biopolitical aspects of California water law in regards to wastewater) and live-tweeted my reading from it. I also tweeted examples of how I write the synthetic note and how I can draft the full-fledged memorandum based on the synthetic note. Below is the process I follow. You can also read the entire Twitter thread to check how I highlight and scribble, though I’ve written a post on my method that you can read by clicking on this hyperlink. 1. I highlight and scribble using the AIC method. I focus primarily on the Abstract, Introduction and Conclusion, as per my post. I think it’s important to be strategic about how we read, because otherwise we get overwhelmed with information. Since I’m attempting to write a synthetic note first, and then evolve it into a memorandum, I focus solely on AIC. What are the goals of the paper? How do the author(s) do their analysis? What are the main contributions of the paper? This is important as it allows me to quickly remember the main details of the article by reading the abstract. Having the article’s abstract available at the top, as well as the citation, allows me to copy and paste in case I need it for a larger document, like a paper, or an annotated bibliography. 3. For the synthetic note, I write the notes I scribbled on the margins and draw key quotations, but I ONLY focus on the Abstract, Introduction and Conclusion. 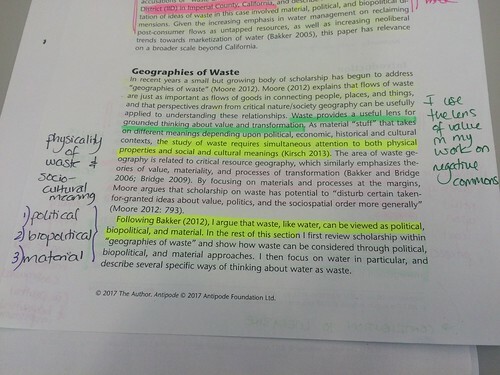 This is important because I can get bogged down in details if I write my notes from the middle of the paper, or if I read and highlight the intermediate components. Remember that I usually write synthetic notes when I am being strategic about what I read. Therefore, if I am doing skimming and scribbling, and I want to get just the gist of a reading, I type a synthetic note. Here is where the process diverges from synthetic note to memorandum. 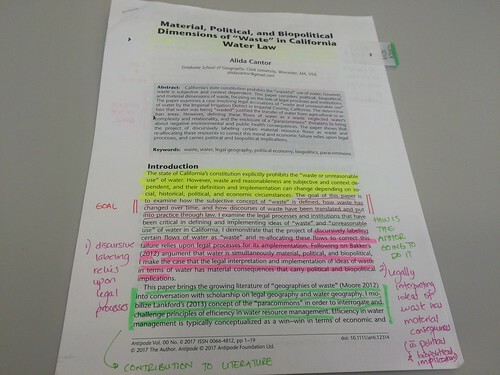 I noticed as I was highlighting the Cantor article that I was writing a lot of notes and highlighting key quotations beyond the Abstract, Introduction, and Conclusion. That’s usually a give-away for when I need to delve deeper into a paper and go beyond meso-level reading to engaging deeply with the document. 5. As I transcribe my notes from the middle of the paper, I create tables, summaries and link to the literature and other authors. How do I know when a reading merits a longer memorandum? That’s a great question. The Cantor 2017 case is a perfect example. It’s an article that is very rich with theoretical discussions (the definition of wastewater, the different theoretical perspectives one can take with regards to waste, the implications of merging geographies of waste literature with legal geographies scholarship), PLUS has great empirical components (focusing on California’s water law, given recent drought events and how California offers a great laboratory for testing theories of water governance). Below is my rule of thumb for choosing when to write full-fledged memorandums. A reading where I write lots of notes on the margins, change colours throughout quite rapidly and draw several key quotations (several being more than 3), and where I find lots of interesting details in the middle of the paper (that is, beyond the AIC components) is definitely a document that will merit a full-fledged memorandum. See my notes on Cantor’s introductory pages and concluding pages. Finally, one important thing that I do when I read is that I maintain Excel, Mendeley and Word all open at the same time. This is important because as I draw key quotations, I can copy them from the Mendeley-hosted PDF and paste them into the memorandum AND the Conceptual Synthesis Excel Dump. Hopefully this post will help my readers understand the process I follow to expand a synthetic note into a memorandum. Tagged with AcWri, memorandums, synthetic notes.